Eco Vape Point Five Ohms Banana Pudding Max VG Short Fill E-Liquid - Money Off! A simple yet satisfying dessert classic, Eco Vape Point Five Ohms Banana Pudding Max VG Short Fill E-Liquid features fresh bananas combined with rich American custard. Eco Vape are a UK-based company that's committed to providing vapers with the highest quality, best value E-Liquid that is sure to satisfy even the most seasoned and picky vapers. The Point Five Ohms range delivers the rich and potent flavours that are expected of sub-ohm vaping, with sweet and bold American flavours. Banana Pudding is supplied in a 0mg 50ml short fill bottle, with free space to top up with the PlusNic Nicotine Booster Shot. Some of our stock of the Eco Vape Point Five Ohms Banana Pudding Max VG Short Fill E-Liquid is nearing its expiry date and, in light of this fact, we are offering the affected stock for a discounted price of £6.00. Act quickly, as this offer is only available while stocks last! Intensely rich and creamy, Banana Pudding combines fresh and sweet bananas with creamy and even sweeter American custard. Great for vapers with a love of dessert flavours, this e-liquid delivers a vaping experience that's rich and satisfying. Banana Pudding e-juice features a 80/20 VG/PG blend for a bold and rich vaping experience. Eco Vape Point Five Ohms Banana Pudding E-Liquid is supplied in a 50ml short fill bottle, with free space for topping up with a nicotine booster such as the PlusNic Booster Shot. 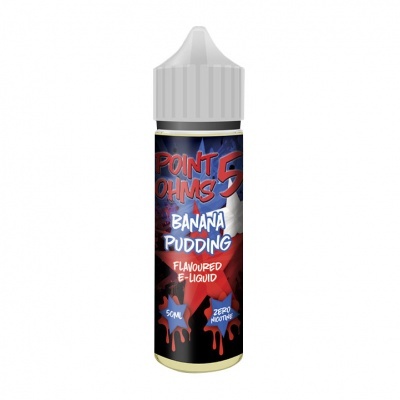 Point Five Ohms Banana Pudding short fill e-liquid is supplied nicotine-free (0mg). Disclaimer: Please be aware that nicotine is a highly addictive substance. E-cigarettes are not intended as an aid to smoking cessation and are intended only as an alternative to other tobacco products.